In terms of volume, North America holds a strong position in the global intelligent assistant-embedded consumer device market. This is due to strong adoption of intelligent assistant-embedded consumer devices with numerous IT companies and electronics devices manufacturers in the region. Intelligent assistant-embedded consumer devices are majorly used in electronic devices. Additionally, increased adoption of advanced technologies and increase in the number of mobile phone users are driving the market in this region. The market in Asia Pacific is estimated to experience the highest growth rate in terms of CAGR during the forecast period compared to North America and Europe. Although North America holds the largest share of market, its growth rate is less compared to APAC. The markets in MEA and South America are projected to grow at a slower pace during the forecast period. 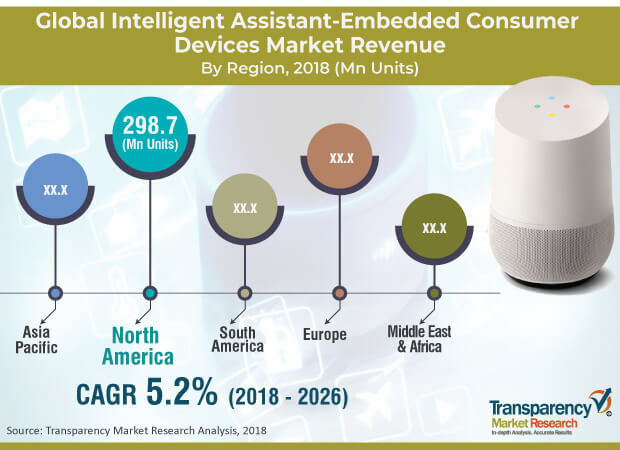 Major players in the intelligent assistant-embedded consumer device market include Microsoft Corporation, Samsung Electronics Co. Ltd., Google, LLC, Apple Inc., Lenovo Group Ltd., LG Electronics, HP Development Company, L.P, Intel Corporation, ARM Holdings, and Amazon.com Inc. Major players in the intelligent assistant-embedded consumer device market are investing significantly in developing systems equipped with latest technology and offer advanced functionality. To expand market presence across the globe, strategic partnerships and collaborations with regional vendors is a major strategy adopted by leading vendors of the market.